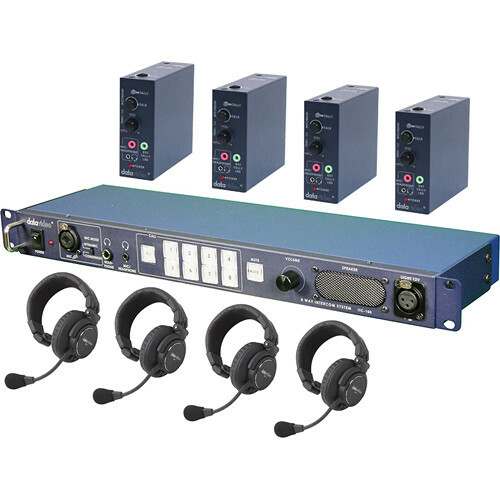 The Datavideo ITC100HP1K wired intercom kit includes an ITC-100 base station, four MC-1 headsets, four ITC-100SL belt packs, four CB-3 cables (65'/20m), four TD-3 camera tally lights, and four HP-1 single-ear headsets. The ITC-100 system features 8-way talkback and tally indicators that provide clear communication between the director and the camera crew, in production studio and live venue applications. The director can choose to talk to an individual channel or to all channels simultaneously. The HP-1 is a circumaural, closed headset designed to prevent sound leakage, in and out. Its single-ear design is well-suited for situations when the user needs to listen to the intercom as well as to conversations in the room. Featuring a noise-canceling microphone and a soft ear pad, the HP-1 offers an ideal alternative to the MC-1 headset, for working in noisy environments with a comfortable fit during extended use. Up to 8 users can be connected to the ITC-100 via PTT wired beltpacks. Four beltpacks, four headsets, four cables and a tally light set are all included. Cables for connecting the beltpacks may be up to 984 ft long, and use 5-pin XLR connectors. The base station features all call and mute buttons, a mic input, built-in speaker, and standard headphone jacks. The Datavideo HP1 Single-Ear Headset is compatible with Datavideo ITC Intercom Systems. It features a closed-back design to reduce outside noise, a soft circumaural earpad and a noise-cancelling microphone. The headphone speaker resists clipping during loud monitoring. Box Dimensions (LxWxH) 20.5 x 15.0 x 8.5"
Box Dimensions (LxWxH) 12.2 x 8.3 x 4.5"
ITC100HP1K - ITC-100 Wired Intercom System with Four HP-1 Headsets Kit is rated 3.0 out of 5 by 1. Rated 3 out of 5 by Berrien from no power unpacked the itc100 8 channel; hooked up beltpack; turned on unit, no power; tried different electrical outlets, still no power.Called company, got a return call in about an hour. I was told they would ship out another unit. Will visit this again after I get new unit. Needed the unit for local sports event but will not be able to meet that need. Might possibly increase or decrease stars depending on how this turns out.